Wild: Today I witnessed an unforgettable sight: the extremely rare Titanosaurus Vagacastrum. Essentially a walking mountain, it is an absolutely enormous sauropod which has developed armored plates of bone protrusions all over its body. Domesticated: I suspect that a Titanosaur, for all its sheer size, is overkill for a lone rider. Rather, for those elite tribes powerful enough to bend one of these titans to their will, the epic creature is employed as a mobile superfortress, capable of ferrying obscene amounts of weight, structures, defenses, and creatures across the island. Some nomadic tribes even have their main base on the back of a Titanosaur! Known Information: Between these plates and its unparalled size, Titanosaurus is extremely difficult to put down. In addition, Titanosaurus seems outright immune to any sort of narcotic effects. They often inadvertently crush nearby creature underfoot with every step they take. While most sauropods ignore non-hostile creatures, Titanosaurs take issue with creatures invading its personal space. This is probably because they aggressively feed off any and all plants they can find. Titanosaurus eats constantly, which certainly helps recover health quickly, even after fighting off numerous carnivores such as Giganotosaurus. 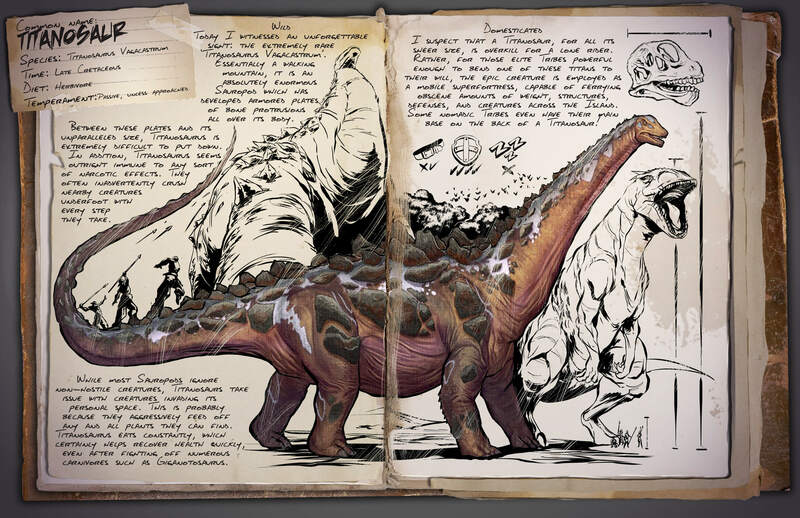 According to the dossier, the Titanosaur is capable of regenerating health quickly. This can be very useful in combat, as only a small amount of time can get you back on your feet (plus, the armored plates of bone are a good source of protection from incoming attacks). Furthermore, it can carry massive amounts of weight; making it a perfect creature to help on your daily gathering of metal and wood, but also when moving structures or a whole base! Going to be a pretty big disappointment if its just slightly bigger than a Giganto… was hoping for REALLY BIG sizing. I can not wait for it to be released!